When the spine’s discs wear out there is often associated pain and collapse of that disc causing nerves to become pinched. 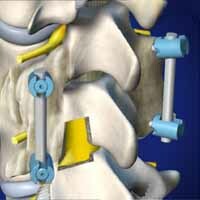 Pain from pinched nerves or arthritis to the disc can be severe and disabling. This is a problem that can be fixed with a new approach. It is minimally invasive and we have assembled one of the top teams in the country for just this procedure. Why? It is a minimally invasive method to fix your problem and we wanted to be the most successful at it. 99% our TLIF patients go home the same day of the surgery. Why is this form of fusion so revolutionary? The translateral approach to the damaged disc is muscle sparing, meaning there is no need for cutting or tearing muscle. We use a very small incision to replace your worn out disc. We are one the most advanced centers in the country for this outpatient technique. Because of these special techniques, we are able to get you back to work and living a life free of debilitating pain quickly and efficiently. If you are certain that a transforaminal lumbar interbody fusion is the right treatment for you based on a referral from a doctor or recommendation from another surgeon, the highly skilled surgeons at Advanced Orthopedics are a great choice for getting this procedure done. You may have heard about a transforaminal lumbar interbody fusion before and are wondering whether or not it is the right treatment for you. If you are not sure this is the right choice of treatment you should explore other options to make sure that the treatment you get is definitely the one you need. As a part of Advanced Orthopedics' commitment to our patients, we have put together a quick and easy to use tool to help determine whether a transforaminal lumbar interbody fusion is the right treatment for you.